Description: A pair of CSX GP15T diesels, 1502 and 1510, work at the railroad's Barr Yard in Riverdale, Illinois, on September 19th, 1997. These units were originally Chesapeake & Ohio locomotives, carrying the same roadnumbers and painted in the colorful (and popular) Chessie System scheme. Description: Leading a mixed freight west out of Curtis Yard on the EJ&E branch line. 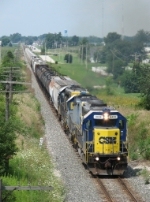 Description: The csx gp15t 1510 leads the J776 out of Frankfort. Description: The local sits at the Knauf siding while waiting for clerance to switch the siding. Description: On the pointof the local is an Ex Chessie GP15T. 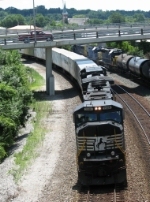 Description: The train waits near the paint store after switching Knauf. Description: The locals engines idle as the train crew goes to lunch. Here you can see the shelbyville "Yard". This is where the CIND/I&O and CSX interchange cars. The CIND line from greensburg to here is currently out of service due to the rerouting of the tracks at the new Honda plant in Greensburg.